I’m back on the stashbusting wagon after falling off buying linen (as well as other fabric) for Mark’s shirt. 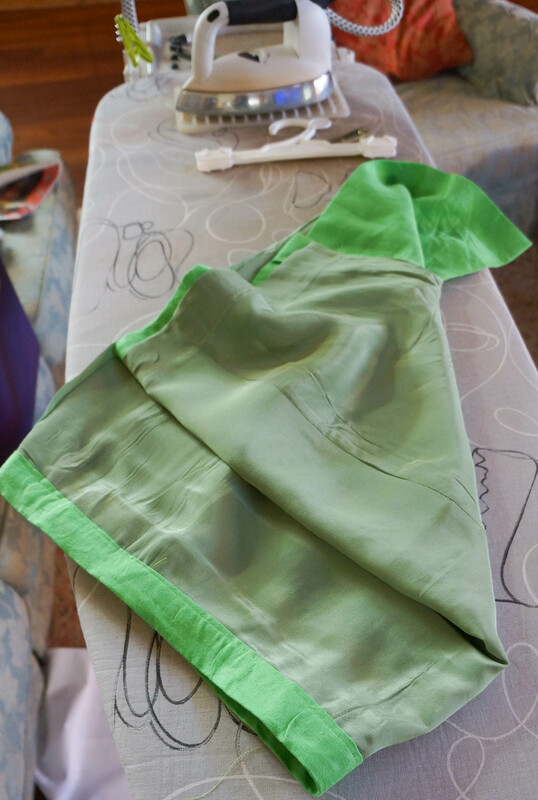 I’ve had this kermit green linen in my stash for more than a year, and I decided to make a skirt with it. The problem is that I had such a small amount that I couldn’t make the skirt of my choice. I thought about Vogue 1247, but decided that I needed a pencil skirt! 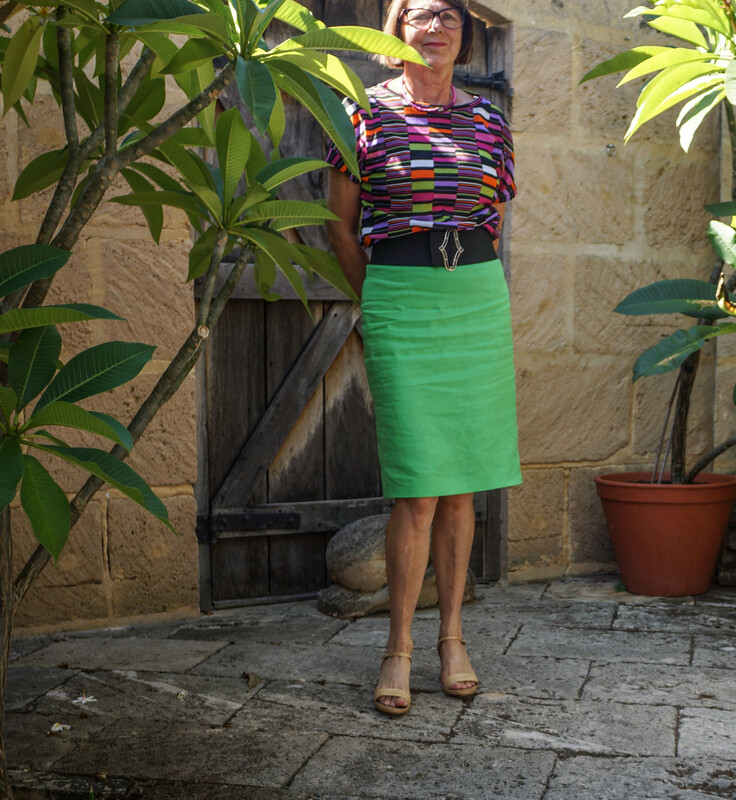 Now I know I have a couple of pencil skirt patterns, but could not find them (in spite of archeological dig style activity), so I drafted my own, using the tutorial from So Sew Easy. The pattern is made to my exact measurements, but I do have an issue in that I made this with post-Christmas podge hanging around on my body, which I’ve now shed so the waist is a tad loose. I just cannot face taking off the waistband and messing around with it, so it is going to spend its life cinched in with a belt. The pattern didn’t have a kick pleat, and I do like them on pencil skirts, so I decided to add one. These photos were taken after a long day at work (and long drive home), so please excuse the wrinkles. Having said that, I don’t think the skirt looks too bad given that it is linen. The zip is out of my stash and is grey, and was quite long. I did shorten it, but looking at the photos, I think I could have made it even shorter. I am showing a photo without the belt. It does fit beautifully on the hips, but is just a centimetre or two too loose in the waist. 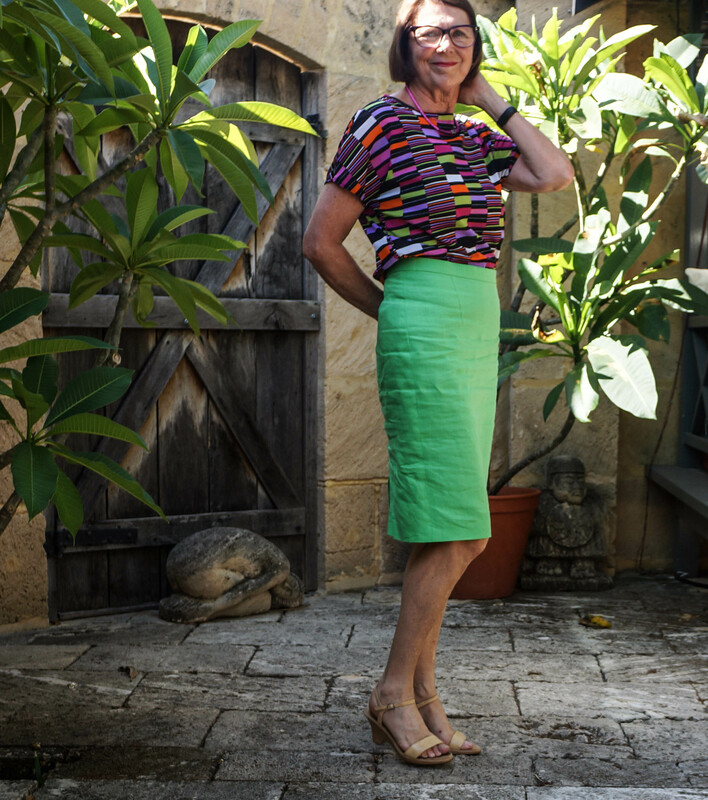 I did line the skirt with some green silk that I bought heavily reduced – I knew it would come in handy one day! Shoes, hmm, about eight years old and bought in Singapore. They are my favourite shoes, but are probably a bit past it now. Thanks Deby, that sloper pattern is fantastic and I already have plans for variations on the pencil skirt. The green looks to be a perfect match with the green in the licorice top. Great style for the linen and love the colour. because I love green, it goes with lots of tops – yay! Love this skirt! Fabulous colour and fit. I would recommend using the tutorial to make a sloper – it is very clever.